1. CHALLENGE: This challenge was suggested by Don VE3HUR. February is the month when the groundhog makes his annual weather prediction of how much longer winter is going to last. So Don suggested we have an alphabet challenge dealing with the names of various furry predictors around the USA and Canada. Of course everyone knows about Punxsutawney Phil. He was even immortalized in a movie several years ago. However there are a multitude of others also. The list we came up with is a sampling of 6 of them including Phil. It's a standard alphabet challenge with the rules we settled on a few months ago after experimenting with different rules for a while. As usual, again this month everyone who completes the challenge and reports their results according to the rules is entered into a drawing to win one of the remaining sets of the bug or paddle handle pieces donated by Gregg WB8LZG. The winner gets to select which variety of pieces he or she needs for their particular bug or paddle. Please let us know when you submit your results if you don't want to be included in the drawing for any reason whatsoever. Otherwise you will be included, and if you win and then aren't interested, we'll have to go through the effort of a second drawing. If you have an idea for a challenge, please let us know and we'll consider it. Thanks to Don VE3HUR for suggesting this and another one coming up in a couple months. Also to KC2EGL for the January challenge and another future one. Congratulations to all including winners and non-winners. Actually everyone who participated and sent in a log is a winner because the listing of your results on our web site shows the ham radio world that you are interested in preserving CW on the ham bands. That's one of our main goals here at the NAQCC. We had 8 stations who didn't submit a log show up from 5 to 12 times in the 54 logs we received and cross-checked. Hopefully those 8 and many others will be back next month AND submit a log. Very special thanks to those who reported their results even though they made only a few QSO's. Those reports are important also. We often receive comments about our NAQCC sprints that describe them much more accurately than I can. Here's one example from Gil K8BTD: "Thanks John for running the nursery for us fledgling contesters. I am really having fun. The straight key slows us down so we can work on accuracy. Excellent idea. All this schooling is for my second attempt at Field Day this coming summer." One aspect of schooling is teaching proper log submission procedures. I'm finding each month that the updating of the web site results and cross-checking of logs is getting easier and easier. A large part of that is due to your consideration in taking the effort to prepare and submit a proper sprint report. I appreciate that very much, especially as our sprint becomes more and more popular and I get more and more reports to process. 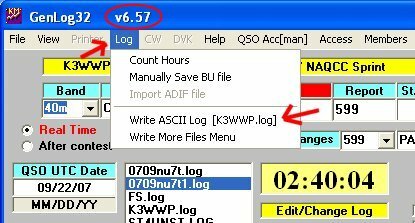 The version of GenLog should be 6.57 or higher, and obviously the file name will show your call, not K3WWP. Be sure when starting GenLog to select the correct contest template - "NAQCC Sprint". For logs not prepared by GenLog. 2. Be sure your call is the first item in each QSO in your log. 3. Be sure to number all new multipliers consecutively (1,2,3,4....) in the new multiplier column of your log AND be sure to use a hyphen (-) for those multipliers that are not new. 4. Format the time correctly - 0130, (NOT 01:30, 130, 1:30, 0130Z) AND be sure the time is in UTC or Z time. There should be no times outside the contest time frame of 0130-0330 (Nov-Feb) or 0030-0230 (Mar-Oct). 5. Be sure all items in each QSO line are in the correct order as shown in the General Rules. 6. Be sure the band is indicated as simply 80, 40, 20, (NOT 80m, 40m, 20m, 3500, 7000, 14000). If those 6 points are correct, your log is likely to be one of the perfect ones. Of course if you use a logging program other than GenLog, its output will be accepted as long as it is close to what is required. If you do use another program, let us know which one, and I'll try to contact the author to see if he can modify its output to suit our needs as Dave W3KM kindly did with GenLog. One final note on cross-checking and the not-in-log errors. When we email you to tell you your QSO is not in the other ham's log, there is never any hint of wrongdoing involved. A not-in-log error is usually caused in a couple of ways. First the other ham logs by paper and accidentally doesn't copy the QSO into his final report. That happened this month and the not-in-log QSO was added in and the score corrected. This is why we encourage you to always check with the other ham when we send you such a not-in-log email. I believe the most common cause of such an error is someone working another station very close in frequency to you, and the timing of the exchange being such that you think he is working you instead of the other station. That has happened to me at least a couple times in my long contesting history. Conversely to add impact to that thinking, I have worked two stations simultaneously a few times. Both were near the same frequency, and when I answered one of their CQ's, they both came back to me, sent their info, and then both received my info when I sent it. Of course we also had a second sprint this month - our annual 160M sprint. The deadline for submitting logs is still a few days away as this newsletter is published, so we'll have the results from that sprint in our next newsletter. If you can't wait that long, check the web site after January 31st when the results are finalized. At a first glance, very few QSO's were to be had unless you had a big antenna system like KG4W's Carolina Windom at the incredible height of 130 feet!!! He was the only strong signal here other than KA8MPT's always strong signal. I think MPT should write an article for the newsletter or even QST telling us his secret of how he gets such a strong signal with just 5 watts output and not all that big or high an antenna. I don't think there are any high mountains in mid-Ohio that he could be on top of. 3. FEATURED AWARD OF THE MONTH: Each month in our end-of-the-month newsletter we are going to talk a bit about one of our awards. This month it's the NAQCC WAC Award. Basically this is similar to the IARU WAC award with a couple of differences. Contacts must be made from January 1, 2004 through the present. You must use QRP, CW, and simple wire antennas to make the QSO's. The station you work must also use CW, but he can run any power for category A & C and any antenna for all 3 categories. There are 3 categories. A - 6 continents. B - 6 continents 2X QRP. C - 6 continents QRPp. Endorsements for single band WAC. Full NAQCC Awards info here. We hope to add your call to the list of award winners soon. There are a flock of awards to choose from. At least one or two should be exactly to your taste. And the cost is minimal compared to other organizations. Full List of all award winners here. We welcome our newest newsletter emailer - Roy W5RJ. Roy joined our ranks as the emailer for members with numbers from 2001 through 2500 when we reach that mark. Roy did a bang up job on his first mailing and I'm delighted with his performance. If you're in his group, you can count on rapid service. Roy is now one of 4 of our mailers using the wonderful PIMEX Mail Express mass email program. If you ever need to do any mass mailings of any kind, I strongly recommend PIMEX. Best of all it is available in a FREE version. The only limitation of the FREE version of any importance is it only handles 300 emails at a time, but if your list is bigger than that, simply split it into groups of 300 or less - no big deal. 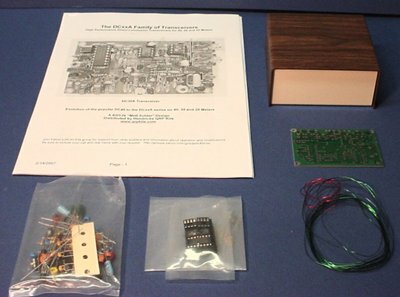 - Our giveaway of the QRP kit has now been decided by a drawing as we had been publicizing in the last few newsletters. If you missed out, better read the newsletters more carefully. There are items in here that aren't mentioned elsewhere. Our winner of the QRP kit was Bart N9AKF. Gregg has mailed the kit and Bart should have it by now or will have it in a couple days. 1) Email BEFORE JANUARY 12 AT 2400Z stating you are interested in winning the kit. The subject of the email should be "QRP kit" and the body of the email should state that you would like to win the kit and include your call and NAQCC number. Emails received after that time will not be entered. 2) Make a combined total of at least 5 QSO's in our Dec 2007 and Jan 2008 sprints. 3) If you currently don't have any kind of HF rig at all with which to satisfy step 2, send a statement to that effect to the email address in step 1, and the QSO requirement in step 2 will be waived in your case. All who thus qualify according to the three steps will be entered into a drawing near the end of January to select the winner. - Tom and I are thinking about loaning our club call out to members for use in our sprints. If that sounds appealing to you, let us know. If we get enough response, we'll set up a plan. If not, well we tried. Just email us, and we'll keep track of the order in which we receive any emails, and the call will be made available on that first come, first served basis. There's no cost, no paperwork, no effort at all. You just sign up and use N3AQC as your call in the sprint. Perhaps we'll assign bonus points for working the club call and you'll be more popular, but in that case we would have to eliminate N3AQC from certificate and award contention to keep things fair. It's all speculation now until we find out if you are interested or not. - We've had a surge of new members lately. A lot of it due to our members publicizing the club in various ways, some of which are: Including your NAQCC number in your email signature. Mentioning the NAQCC in your QRZ.com biography, your own web site, or any of a myriad other ways on the Internet. Having your membership number (with our club logo if possible) on your QSL card (and eQSL card). Oh, there are just so many ways, I won't list them all here. I probably can't even think of all the ways. 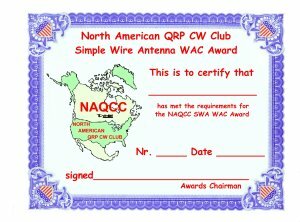 Just keep up the great work, and remember every single mention of the NAQCC in any way may just lead to a new member signing up to join the fight to preserve CW on the ham bands. - Many seem confused about where to send NAQCC email. All you need to do is click the 'Contact Us' link in the navigation panel at the left of almost all web site pages, and you will get a complete list of contact info. - Remember it is very easy to get to the NAQCC web site. If you can't remember the URL or are at another computer that doesn't have the site bookmarked or in favorites (why not? ), simply type 'naqcc' in the browsers address bar or search bar, and click on the first item that shows up. That happens with Internet Explorer and Windows Live for certain, and probably in other browsers and search engines as well. I only use those two here so I don't know for sure. 5. MEMBER NEWS: Humility is a great virtue, but it makes for a dull member news section of the newsletter. How about shedding a bit of that humility and shyness and tell us about your accomplishments with QRP and CW. I'm sure each and every one of our 2,200 plus members has done something noteworthy lately, yet only 2 of those members have sent in a news item to us about it. Why not? All that is necessary is to send a brief description of your accomplishments to our news editor Paul KD2MX at so he can convert it into a news item like those here. From John, K3WWP #0002 - I took part in the HAARP HF Moonbounce test on the 19th and 20th of this month. Briefly, it was a test in which a 2 second pulse of RF was sent to the moon followed by a 3 second pause to listen for the return echo which due to the speed of radio waves and the distance to and from the moon at the time would occur at approximately 2.44 through 4.44 seconds into the 5 second time frame. The whole 5 second sequence was repeated for an hour on a frequency just below the 40 meter band and for a second hour on a frequency above the 40 meter band. I was able to copy the uplink signal very well on the first night of the test in the 0500Z hour, but with my high local noise level I was unable to hear the return signal. The second night I heard nothing at all. The 2 second pulse was not modulated in any way. I believe had it been sent as a couple of Morse letters, I might have been able to dig it out of my noise, but that's just speculation. If you'd like to read more about the test, just search 'HAARP' on the Internet via Windows Live search. From Karl, N3IJR, #1770 - Well it happens every year. It's about a month after SKN and my straight keys are still out and plugged in. It seems they stay out longer every year. I have enjoyed so many really neat QSOs since SKN on 80 meters. The one that comes to mind is a three-way QSO with Bill, K0CDJ, a former "Sparks" on the Great Lakes, and Dale in Texas, a guy who uses nothing but vintage gear, straight keys and side swipers. What a joy to work guys who send great code with straight keys. I sat back last Sunday as we chatted and let my mind go back to days gone by that I never had a chance to enjoy. There I was sending code with two veterans and having a ball. It is so neat to listen to the "Fists" of other guys and really hear their signature in code. I guess as Bill Pierpont, N0HFF, put it in his great book, The Art and Skill of Radio-Telegraphy, it really is the "Art" and "Skill" that draws me into the most wonderful mode in Armature Radio. So I get on the air with my straight keys and spend time on the practice oscillator and even record myself so I can figure out how to improve my sending. All of this is why I have a hard time putting away the straight keys and going back to the paddles. Let me share this with you, if you spend some time on the straight key it will make you a better paddle person! Have fun and remember CW is Forever! 73 Karl. The publication of our next newsletter will be announced via email to all members for whom we have a valid email address unless you specifically have unsubscribed from the email. Past on-line newsletters beginning with issue #042 are now archived on the site. So if you missed seeing any past issues, you can check them out in the archives. Unless otherwise credited, all items are written by K3WWP. If you came directly to this newsletter, we invite you now to browse the NAQCC Web Site.